I believe that creativity is a form of energy that is within each of us and we can access it through different means. For me, it comes when I create from the heart, with a playful attitude, experimental mindset, curiosity for what will come through the process and a sense of wonder at the beauty of nature. When I am in this mindset, I lose myself in the process, forget the worries and fears and let the process flow. I know that creativity cannot be forced. It must be allowed to flow and come and go in it's own time. So what stops the flow? Sometimes, it's perfectionism. When the project I am working on becomes "The Project," some idea that I have to get right at all costs, my thinking becomes clouded and cluttered. I forget to relax, play, and experiment. In these cases, I need to remind myself that perfection does not exist and that what I create can just be 'good'...and 'good' is quite enough. Sometimes, it's expectation. I'll have specific ideas about the type of blog post to create or a certain image to capture. But, on the way, it develops it's own mind and becomes something quite different than what I initially intended. When this happens, I find that I need to just let got and follow the flow. Being rigid never leads to anywhere interesting, so I may as well follow the adventure and figure it out along the way. And this is how the creation of 'A Meeting in the Woods' is manifesting itself. My intention for 'A Meeting in the Woods' was to present all 10 creatures at once. What I am now finding out is that some of them want to be released sooner than others. Some of them would prefer to be released with a friend or two. And then, some of them tell me they just don't want to come out and play...not now, anyway. Forest beings live by democracy, much like we do. As such, I am obliged to follow their wishes and will now introduce to you a single small fairy by the name of Morselfina. Morselfina was inspired by my recent obsession with butterflies. It all began with a custom request that started way back in April...and I'll tell you more about this creation when the time is right. Since April, butterflies have been with me all around. They keep coming in different forms...as if to tell me that I need to complete something before I move on from them. At some point this Spring we were gifted a butterfly set to grow and we did. And my children had the most fantastic time letting them fly away at the end of their metamorphosis. Not to mention, the details we learned through the process of growing them from caterpillar to butterfly. Also, in July, my husband gave me one of the loveliest, most beautiful birthday gifts...a set of real, but dead exotic butterflies preserved in a box. From these things, came my need to create butterfly fairies. And Morselfina is the first of them. Her body is made from 100% cotton interlock. She stands 6 inches tall. She is a sitting doll. Morselfina's hair is made of mohair yarn crocheted into a wig and stitched securely to her head. Morselfina comes bearing a head full of tiny Morpho butterflies cut from 100% cotton and were individually stitched one-by-one onto her tiny fairy cap made of 100% cotton and lined with the same fabric. The tie on her cap is hand knitted using a mohair and silk yarn. 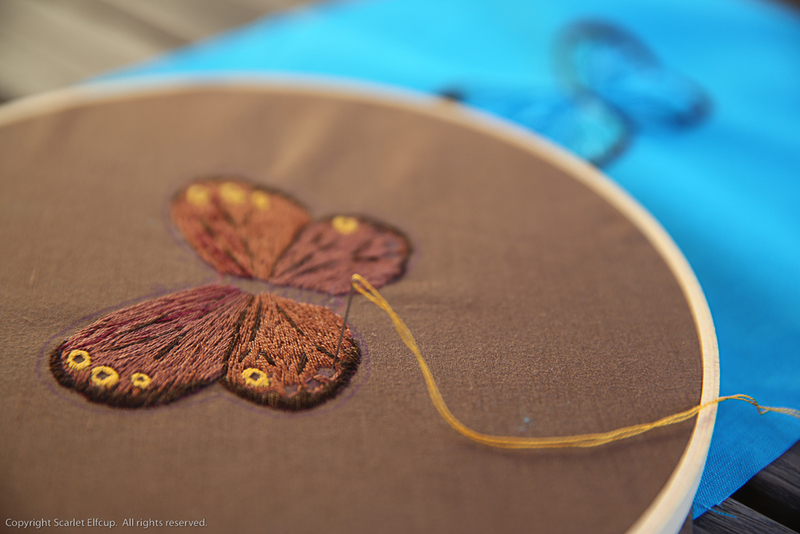 Morselfina's wings....hand embroidered on 100% cotton fabric, with the finest 100% cotton, hand-dyed embroidery thread made in France...just because I had an itch to hand embroider something beautiful. Did you know that the Morpho butterfly's wings are iridescent and brilliant blue on one side, but patterned with browns and spots on the underside. Hence....double the embroider-thon. Her wings took all of 20 hours to complete. The wings can be put on and taken off of Morselfina and they are attached to her with straps hand knit from a mohair/silk yarn. Morselfina comes wearing an itty bitty strapless fairy dress made with 100% cotton trim, lined with 100% cotton fabric under the tulle and a tiny flower stitched to her dress and made from tiny wood beads. Underneath, she wears a set of matching bloomers made of 100% cotton. Finally, her tiny toes are wrapped in tiny shoes hand knit using a 100% alpaca yarn. 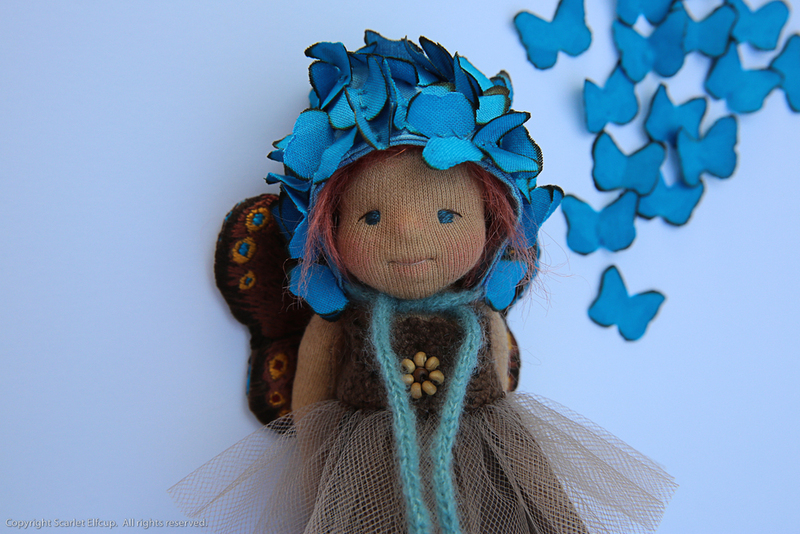 Morselfina...a wee fairy keeper of Morpho Peleides...to bring a bit of magic to your day. Morselfina will be looking for a loving home to flutter to. She'll be waiting in the Dollectable shop tonight, August 1, 2016 starting at 7:00 PM (EST). She'll hang out there for 24 hours. After that you may find her fluttering about in the Etsy shop.